Hardwood Floor Specialists has been expertly installing wood, hardwood, and bamboo flooring in Orange County homes and businesses since 1967. We've worked with architects, designers, contractors, and home and business owners to design and install a wide variety of floors for restaurants, dance studios, office buildings, retail stores, high rises, and numerous other venues. 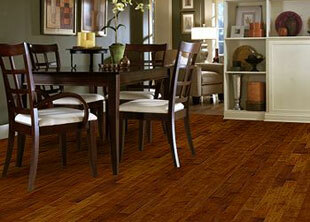 We're proud to provide the widest selection of hardwood and wood flooring at the best value in Orange County. Over the past 45 years, our family-owned and -operated business has offered customers in and beyond Orange County a wide selection of flooring in a range of designer styles and many different types of wood, from Australian Blackwood to American Elm. We have over 4,000 samples to choose from, and approximately 85%–90% of our hardwood and wood flooring is always in stock. We provide free on-site consultations and accurate cost estimates, and if you hire us to handle your flooring job, one of our dedicated designers will check in on your project every step of the way. Whether you need flooring throughout your home or business facility, or only want planks replaced, our experienced team will assist you throughout the entire process. With thousands of referrals over the past several decades and an unmatched local inventory, Hardwood Floor Specialists is Orange County's best choice for hardwood, wood, and bamboo flooring services. We are fully committed to customer service, value, and excellence, and your satisfaction is guaranteed.